3D printing is beginning to spread. Gadget for some, this technique becomes useful in more and more activities. 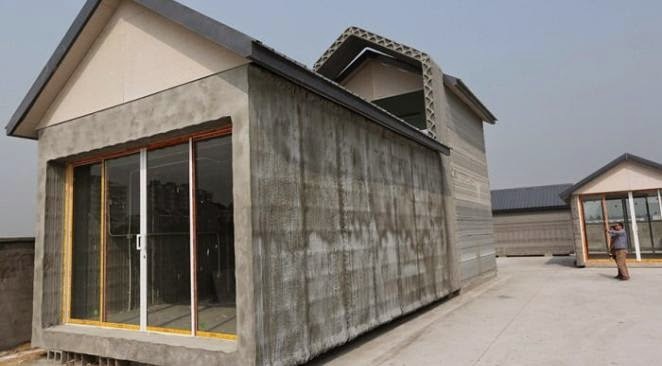 A Chinese factory went very far in producing houses in 3D, Fast and very economical, this might interest many countries. Reproduce a three-dimensional object. It has recently become possible thanks to the three-dimensional impression. First exploited by the aviation industry, automotive, dental, etc.., It becomes more accessible to the general public by the provision of specific printers, the most expensive elements of this technology. Consumers begin to familiarize themselves replicating simple objects, but companies from different sectors looking to use 3D to make complex parts. In China, a company has to show an amazing 3D application. Indeed, Shanghai WINSUN Decoration Design Engineering Co comes to use 3D to make houses. With a giant printer 32 m long, 10 m wide and 6.6 m high, the company builds homes from recycled rubble from construction sites. Printing is performed by a successive multilayer coating. When finished, the concrete is poured into the space left free and metal beams are inserted to support bearing walls and floors. This new method is very fast. Indeed, the company has built 10 houses of 200 m2 in less than 24 hours! It is also very economical because a house built and returns to 3500 dollars. This technology might be interested in many countries and solve some problems of housing.